The disaster is a construction failure born of design errors and what appears to be a misguided attempt to address them by adding tension to a critical, failing truss without closing the road below. The collapse of the Florida International University pedestrian bridge one year ago has left a trail of deep personal loss and professional finger-pointing – but few answers. The disaster that killed six people on Southwest Eighth Street at 1:47 p.m. on that warm, clear Thursday is a construction failure born of design errors and what appears to be a misguided attempt to address them by adding tension to a critical, failing truss without closing the road below. But it is rooted in the university's ambitious plans to leave its mark on the region. Seeking bidders for the project in June 2014, FIU envisioned "an innovative signature bridge that will become a respected and valued design landmark in Miami," part of a project linking the campus to Sweetwater. "If we get the bridge right, everything else can fall into place. If we get the bridge wrong, nothing else will matter." 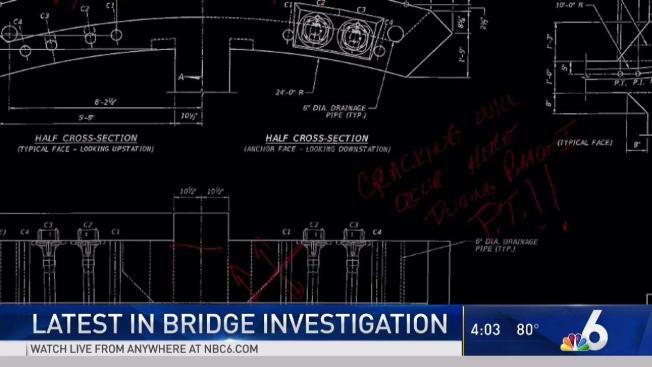 It turns out, a lot matters, including how the families of six dead and one critically brain-injured patient will get justice for what they claim in lawsuits was negligence by the general contractor, MCM, the designer, FIGG Bridge Engineers, and 23 other companies involved in the $12 million contract. Eleven other people are suing as well. In just the last month, FIU and the Florida Department of Transportation have been added as defendants; FIU announced it has submitted a claim against MCM over the disaster; and MCM has filed for bankruptcy, seeking to reorganize and avoid paying those whose deaths and injuries they allegedly caused any more than the $42 million it has in insurance coverage. To help the public understand what was – and for some families, still is – a devastating event in our community, the NBC 6 Investigators have compiled a detailed timeline including documentation of some key events along the way. There were problems with equipment used during the lift and placement of the bridge on March 10, 2018. An engineer with Bridge Diagnostics Inc., a Colorado company that installed and monitored sensors to track forces exerted during the operation, says a software program designed to track relative changes in the bridge's position -- called offsets -- appears to have malfunctioned: "When the computer was turned back on after a break, the software program that carries the offsets for each sensor did not automatically pull the offset file as it should have once the file was reopened," according to an investigation revealed in court records by the claims administrator for BDI's insurer. Al Brizuela, a professional engineer consulted by NBC 6, said if the offset readings were wrong during the move, engineers may have received inaccurate data. A call to BDI seeking further explanation has so far gone unanswered. Almost immediately after the bridge was placed on its pier and pylon, a subcontractor took at least one photograph of cracking on the north end and texted it to his employer, according to lawsuits. Previously, the first known pictures of post-placement cracks were taken three days after the move. In March 2016, one month after FIGG produced a set of early design-build plans, FDOT engineer Tom Andres, who was concerned about cracks forming in the "tricky" design, asked a FIGG engineer if the firm had considered a different design – "a real cable stay" bridge, where cables attached to the 109-foot-high upper pylon would help support the deck and canopy. Andres calls the FIGG design a "fake cable stay" because the tubes that were to extend down to the canopy were largely ornamental. FIGG stayed with the fake cable-stay design, its plans state. FDOT allowed FIGG to proceed to final plans without having them double-checked by an independent peer reviewer, which the contract specified should be done when the 90 percent plans were submitted. FIGG wanted to do its own review out of another firm office, but FDOT insisted they get someone independent, according to email exchanges reviewed by NBC6 Investigators. By the time FIGG executed a $61,000 agreement with that independent firm, Louis Berger, one of the sets of plans had already been certified by a Louis Berger engineer and all required plans did get certified eventually. Andres wanted to know for months where FIGG intended to place two transporters to lift the bridge from its roadside construction site and place it over Eighth Street. In March 2017, FIGG said the transporters would be directly beneath where diagonal trusses met closest to each edge of the span. But on Sept. 18, 2017, FIGG accepted a change in plans that put the north transporter more than 7 feet farther away from the edge – something that would change the forces applied to the north side of the bridge during the lift-move-and-place operation. Records released so far do not show FDOT's engineer being informed of the change; nor do they show revised plans adjusting post-tension bar forces to accommodate what Brizuela said would have been a significant change in forces exerted on the north end of the bridge during the move. The move on March 10 had to be stopped 10 to 15 times because the span twisted greater than one half of one degree -- requiring workers to readjust rigging supports each time, according to the claims administrator for BDI's insurer. When it was lowered into place, the readings were slightly over one half of one degree. The bridge was straightened prior to being put it in place and engineers on site agreed it was a successful move. A call to BDI seeking further explanation has so far gone unanswered. Exactly how significant any of those issues is remains cloaked in secrecy imposed by the National Transportation Safety Board, which is forbidding any of the parties to their investigation from commenting. It also has issued a blackout on all documents created after Feb. 19. 2018, until its investigation is completed. The NTSB says the cutoff date was "not arbitrary." The NTSB "determined that while the earlier information is important, it is not as critical to the investigations as information after that date." An NTSB lawyer this week said he expects the investigative report will not be done until possibly late September, a lawyer for plaintiffs told a judge this week. What we know for certain is this: At 1:47 p.m. last March 15, as the re-stressing of the bars in Member 11 continued, a failure occurred and the 950-ton structure crumbled onto SW Eighth Street, killing five people in vehicles: Alexa Duran, 18; Brandon Brownfield, 39; Alberto Arias, 53; Osvaldo Gonzalez, 57; and Rolando Fraga Hernandez, 60; and one worker, Navaro Brown, 37, who was on the bridge canopy at the time. A co-worker, the one who texted a photograph of cracking on March 10, Kevin Lee Hanson, suffered a critical brain injury and remains in a neurological rehabilitation facility.